Children bring their own lunches from home and the center provides milk for lunch. 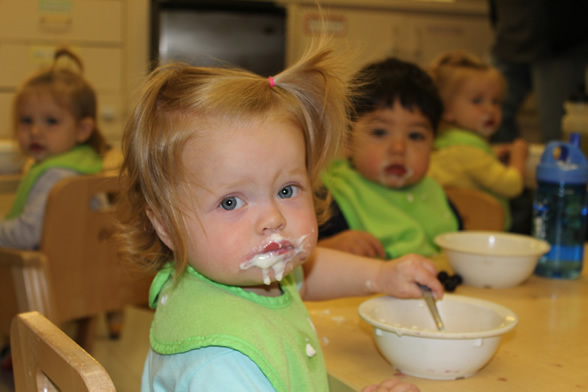 State child-care guidelines specify that each child’s lunch must include at least one serving from each of the following food groups: fluid milk (provided by the center); breads and grains; meat, fish, poultry, or meat alternatives (e.g. dried beans, peanut butter, yogurt, or cheese), as well as 2 servings of fruits or vegetables. Teachers check lunches daily for these food groups. Serving sizes can vary according to a child’s age, and appetites increase as children grow. Teachers can supplement with food from the center if needed, and will notify you if your child is consistently hungry after finishing their lunch food. We also ask that lunchboxes are labeled with the child’s name, and that each lunch box contains an ice pack to keep cold foods cold. Morning and afternoon snacks are provided by the center. Snack always consists of at least two of the following food groups: breads and grains; protein; fruits and vegetables; fluid milk. In many classrooms children are also provided an opportunity to revisit their lunchboxes at afternoon snack to finish any uneaten food. Snack menus are posted in every classroom. Children in the Dreamers classroom consume only food brought from home. Children are fed as needed and according to parents instructions. As these children get older and are ready for milk, the center will provide that for meal times. Feeding times and food consumption information are provided to families at the end of the day. Occasionally parents bring food for all the children as snacks or for celebrations. This food must be commercially prepared.